15 SAS or SATA drives in one box using only a single SFF-8088 MiniSAS cable for great storage density. Supports both 3.5" and 2.5" drives. SAS reliability and performance. 2400MB/sec bandwidth. Fully hot-swappable, lockable trays, fan failure & temperature alarms. Reliable 500W whisper quiet power supply. Ideal desktop direct-attached mass-storage solution. 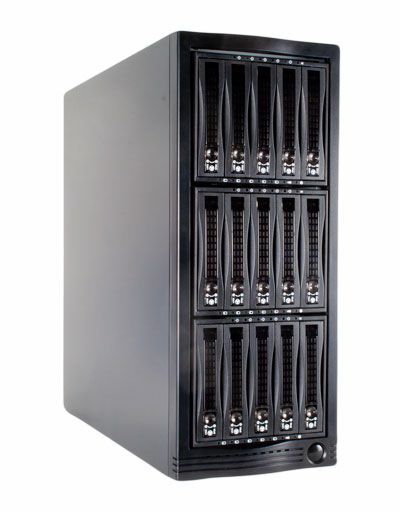 Completely hot-swappable design, no shutdown required for installations or drive replacements. One additional miniSAS connectors for daisy chaining, zoning or dual-connection capability to the host for cable redundancy and slightly increased bandwidth. Compatible with nearly all 3.5" SATA and SAS hard drives, including 14TB and larger - "green" drives not recommended. Can be used with 2.5" drives without the need for converters. Each bay can be powered on/off independently. 3 80mm cooling fans in the back, as well as 80mm cooling fans behind each drive cage. 15 hotswap trays (drive carriers) included.